The Cricula silkmoth, or Cricula trifenestrata, is an easy to keep butterfly species with very funny looking caterpillars. It is found in India, the Phillipines, Java and Sulawesi. Cricula trifenestrata is given his name because of the three windows in its wings (tri = three, fenestrata = windows). The “windows” are three places in the wing that are completely transparent. There are no holes there. 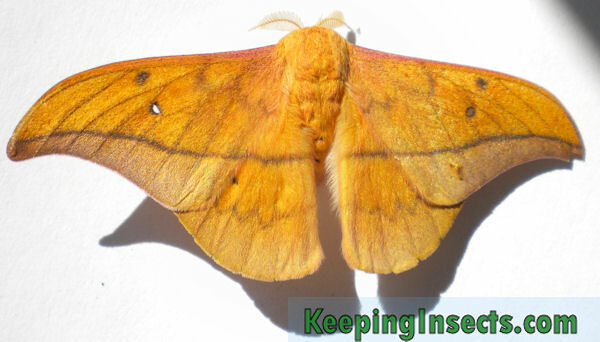 This species of moth is orange with different shades of brown, and has a very nice straight line across the wings. The lower wings have a purple-pink haze. The body is hairy and orange. The butterflies are up to 9 cm in wingspan. The caterpillars look really nice. When they are born, they are very small (0.5 cm) and yellow with a little bit of hair on their body. As they grow, they become red with white and black stripes. They have long white hair over their whole body. A beautiful color combination! Cricula trifenestrata female moth seen from the underside. It is playing dead. The caterpillars of this species eat many different kinds of plants. You can feed them with one species of plant or with several species, but preferably there must be rhododendron in their diet. They eat the leaves of rhododendron, oak, willow, cinnamon, plum, walnut, apple, and probably many more species of plant leaves. You can check out our Food Plant page to learn to recognize wild plant species. The adult moths do not eat. They have no mouth! The caterpillars eat most of their time. They also molt a couple of times, they do this by gluing their feet onto the ground and then walking out of their old skin (which is attached to the ground). When the caterpillars pupate, they spin a yellow cocoon. Their pupa is dark brown and darkens with time. The caterpillars are about 6 cm long before they pupate! The butterflies can fly and they usually do so at night. Do not grab them by the wings, but let them step on your finger by pushing gently at the moths feet. Sometimes the moths let themselves drop to the ground and they hold their legs to their body. The do not respond to touches anymore: this is playing dead (death feigning). The caterpillars and butterflies can not bite or sting, they are completely harmless. The ideal temperature to keep the caterpillars and moths is about 25 ° C, but room temperature (20 °C) will do. Caterpillars should never sit too damp, because they can have problems with infections. When you feed the caterpillars new leaves, you can spray the leaves to supply some moisture to the animals. A suitable residence for the caterpillars of this species is a plastic box with lots of ventilation. This ventilation can be achieved by a mesh cover for example. You can put the leaves in a cup of water to keep them fresh, but you can also lay them down and remove them when they are withered (or eaten). At the bottom of the enclosure you have to place some tissues. You have clean the enclosure once a day by changing these tissues to prevent mold and dirtiness. When you find the cocoons, you can hang them on a thread following this method. Keep the cocoons a bit humid, around 60% RH. The enclosure for the butterflies should be at least 40 x 40 x 40 cm, preferably (much) more. Bigger is always better, as long as the cage is safe. Do not give the butterflies a glass or plastic cage but rather one made of mesh. They do not require much humidity and they cannot drink or eat. 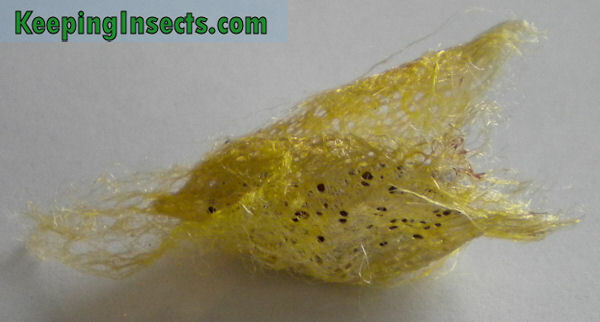 Cricula trifenestrata cocoon, beautifully golden yellow. The eggs take about 10 days to hatch. The caterpillars eat about one month long, until they pupate. The pupa develops within 3 weeks to butterfly. The butterfly lives is still about one week. The adult males of this species are recognizable by their wings, their smaller size and more pointed abdomen. The females are noticeably larger with broader wings and a rounder abdomen. The most easy way to distinguish the males from the females is by looking at the ‘windows’ in the wings of the moth. The ‘holes’ are much bigger in the females than in the males. The pictures on this page will clarify that. To breed you just need a male and a female and the correct temperature. They will start mating really soon after eclosion. The female lays about 200 to 300 eggs in her life. Just keep the eggs on a moist piece of paper until they hatch. Do not let mold grow on the eggs, this can kill them really easily. The best way to prevent mold is to let the eggs dry a bit before watering them again. Complete drought can kill them tough.